Being natives of Kansas City, we believe we know a little about barbeque. 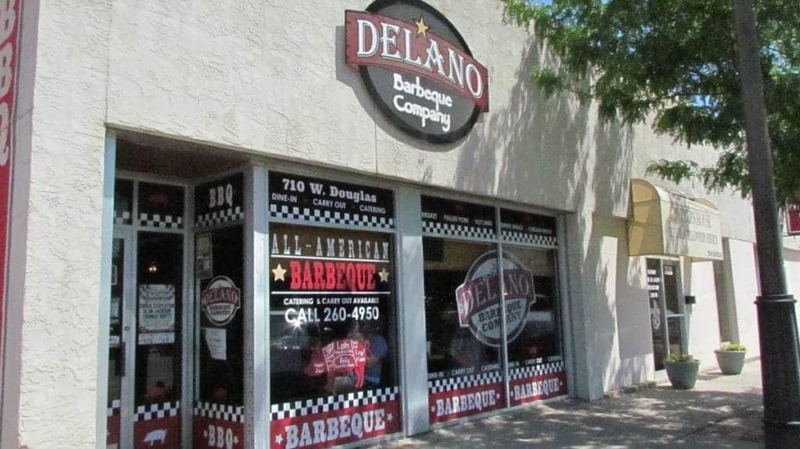 The opportunity to add Delano Barbeque Company to our itinerary meant a chance to sample one of our favorite cuisines. 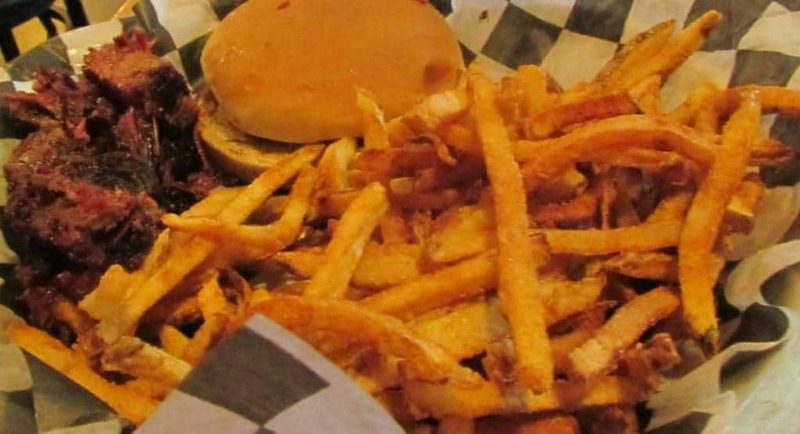 This restaurant has only been around for a little over a decade, but it has certainly established itself as a Wichita staple in that short time. We want to thank the Visit Wichita for their hospitality. Rest assured that all opinions are our own. 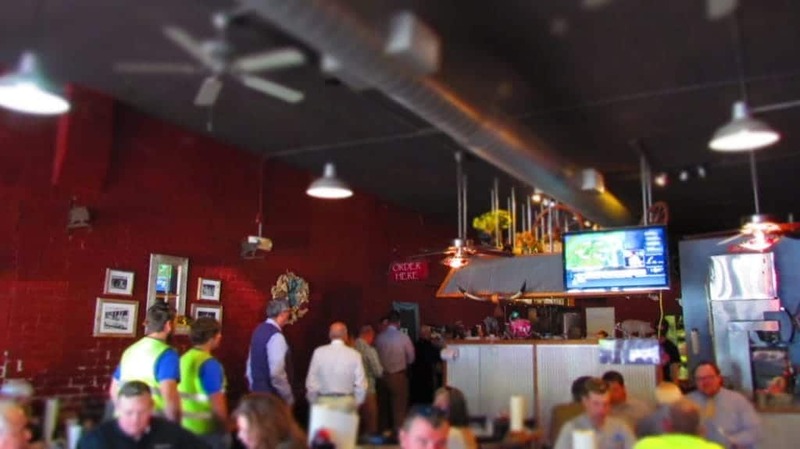 We had scheduled our visit to Delano BBQ for a Friday lunch period. Susan, from Visit Wichita, had asked to join us. Earlier in the week we had met her for breakfast and enjoyed her company so much that we were glad to have another opportunity to chat. We arrived a bit early, which gave us a chance to walk up and down a few blocks of Douglas. We popped in a couple of stores, and visited with some of the shopkeepers. It was a pleasant way to build up our appetites for the upcoming meal. 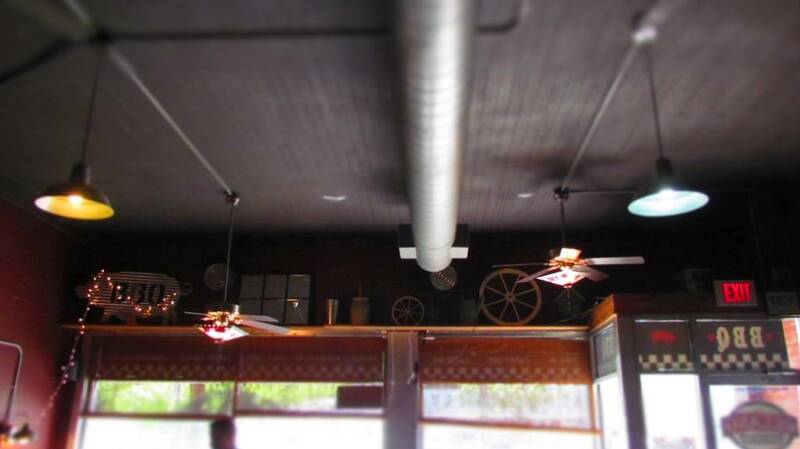 As the time drew nigh for our visit, we took our purchases back to the car, and headed into the restaurant. We arrived a few minutes before Susan, which gave us a chance to find an open table. This place is certainly a popular lunch choice for many of the locals. It was quickly apparent that the food appealed to a wide range of people, since we saw every type of worker, from business suits to construction workers. The ordering system at Delano barbeque is fairly simple. Diners enter and move into the line that leads to the register. Here you place your order, get your beverage glasses, pay, and then head to find a table. In a short period of time someone will call out your order, and you go to a different counter to pick it up. It almost never fails that people tend to gravitate toward specific menu items when they visit a specific style of restaurant. A good example is Crystal when we visit a BBQ joint. She almost always picks the burnt ends. I bet I could just go up and order a burnt end plate, and she would almost always be okay with it. Now to be fair, I don’t consider this a bad thing, since it gives her a very methodical way to test the quality of the product that the restaurant is offering. For Delano barbeque, she gave them a passing grade on their burnt ends, which she ate without the bun. The ends are good-sized cubes of meat, and very tender. the flavor was obviously acceptable, as she never added additional sauce. Her fries were tasty and crispy, and I know this because I stole a few from her. In my defense, I gave her an onion ring in exchange. Now as much as Crystal always picks a certain item, I have to admit that I am partial to ribs. 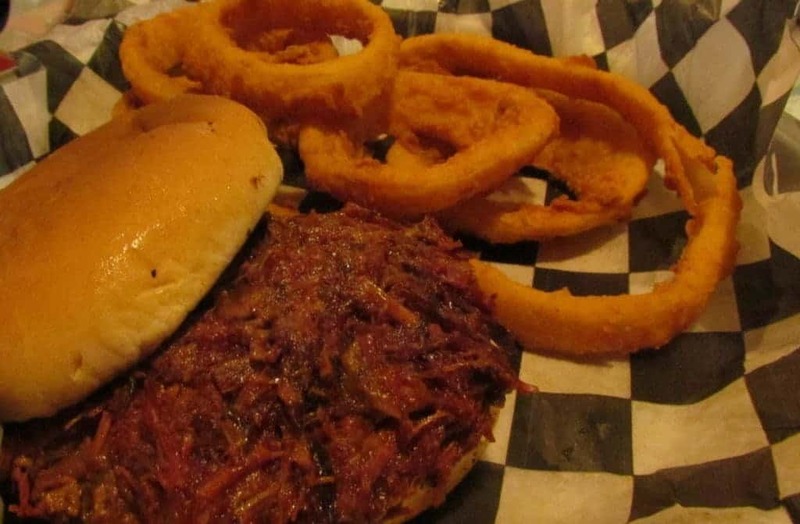 Of course, here I chose to divert from my norm, and ordered a brisket sandwich with onion rings. The meat is plentiful, and has a good flavor and texture. The brisket is chopped instead of shredded, so the bites are not so chewy, which is a good thing. It also means that when you take a bite of the sandwich you don’t have a long string of meat pulling out of the bun, and slapping you in the chin. The onion rings are crispy, but I would have accepted a few more in my order. As I mentioned in a previous article, I had forewarned Susan that her meal would become subjected to photography prior to being eaten. Once again when this arose, she was a trooper and sat patiently waiting for me to finish. For her order, she selected the one meat dinner, which comes with two sides. Her meat of choice was the chicken breast, which she told us is delicious. Her sides were the spicy Cole slaw and onion rings, and they also toss in a piece of garlic toast. As we dined we talked about all of our adventures to date in Wichita. Susan also told us a little historical background on the Delano area. It appears that this part of the city was frequented by the cowboys fresh off the trail, so it had it’s seedy side at times. 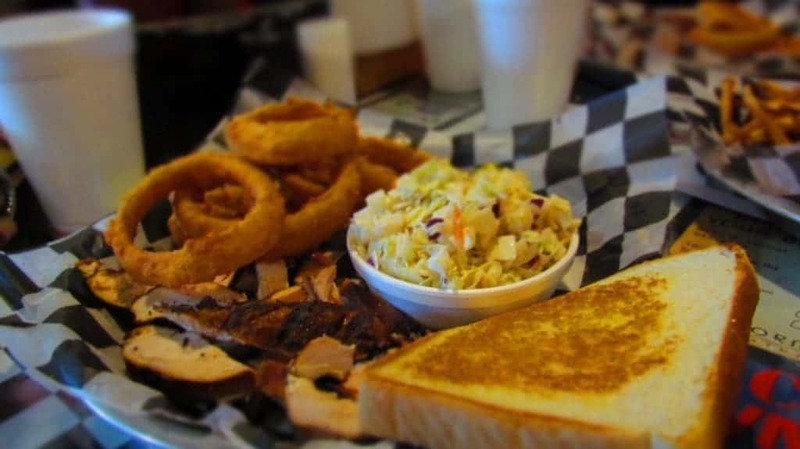 We are pretty sure that if cowboys were still driving the cattle into Wichita today, they would be visiting Delano Barbeque Company for a hearty meal. Was wondering if you two were missing Midwestern BBQ. Enjoy your time in Belize.